Open up /etc/network/interfaces with a text editor. After editing the configuration file. Save and exit the text editor. or you can just ifdown and ifup the interface. Creating an alias for a long or complicated command can help to save alot of time and trouble. To create a basic alias, we use the alias command. The following will alias the command “VirtualBoxManage” as vbm. To make the alias permanent and usable reboot, we can add the command to the system wide .profile file. Browse to /etc/profile and append add the alias command at the end of the file. To make the alias permanent only for a certain user, add the command to the .profile file inside the user’s home folder. VirtualBox is a virtualisation software. Add the http link that can be retrieved from the website stated above. I’m using Debian Squeeze, so I’m going to add the Debian Squeeze’s line. Add the VirtualBox’s public key and install the required packages. To run a headless VM, we’ll need to also install the extension pack. First we’ll need to go to the tmp directory and download the installation file from VirtualBox’s website. To rip an ISO to a local directory. We can use VBoxManage –help to view the various commands and parameters that you can implement. For more commands to control your VMs, do a VBoxHeadless –help. Once the VM is started, we can now use a Windows client in the network to RDP in using the host’s ip address and the listening vrde port. If you’ve used VMware to virtualise Debian, I’m sure you’ve encountered the irritating system beeps whenever you use the TAB key to auto complete. To turn off the system beem is a very simple process. The following command will remove the system beep. However, the effect will only last until the next reboot. To make the effect permanent, open /etc/modprobe.d/blacklist with a text editor. Add the following line to the file. What it does is that it blacklists the kernel and prevents it from loading during boot up. 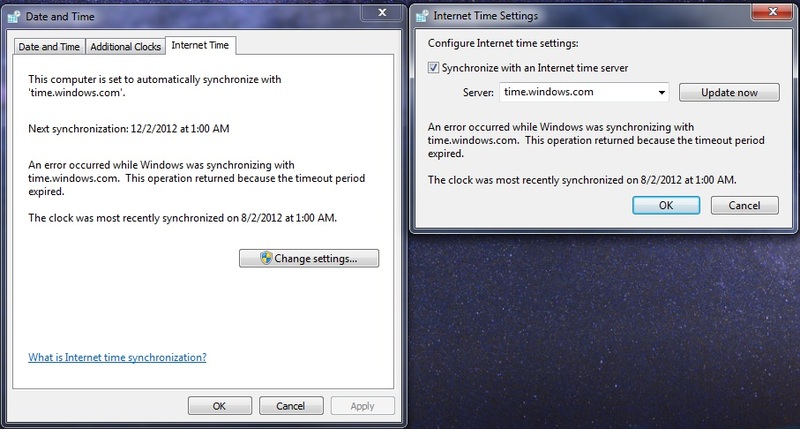 To sync Windows with Debian’s time, we are going to use the NTP. First of all, we’re going to set up NTP on the Debian PC first. After that, open the configuration file with a text editor. Edit the configuration file so that it looks something like below. What it does is that it sets the NTP to listen to the interface with 10.10.0.1 and set the local pc to sync from the debian.pool.org time server. Save and restart NTP service. Now, after we’re done with Debian, we can start working on the Windows Server. For Windows Server 2008 R2, we will first have to manually configure the time to be close to the time on the Debian server. This is to ensure that after we’re done setting up, we won’t have to wait for a long time for the time to sync. Open the registry editor by going to run->regedit. Do a backup of the registry if needed. Below are the registries that requires editing. For my case, i'm setting the poll interval to be 900 seconds. That is all for the registry editing. Open command prompt and enter the following command to restart the w32time service. For Windows XP/Vista/7, it is much more simpler. All we have to do is to open date and time from control panel, go to the Internet Time tab and click on Change settings…, replace time.windows.com with the IP address of your NTP server and you’re good to go. To test if the synchronisation have taken place, open command prompt and enter the following command. You should see this in your console. Squid serves as a proxy in the network. To install Squid on the Debian machine. After installing the package, open up the config file with a text editor. Use ctrl+w and search for the keyword “TAG: http_port = 3182”. Edit that line to a port that you’re going to have the squid server listen to. For this case, 8080. After that, add the following acl rule under the acl section. Scroll down and uncomment the the following line. Exit the localRestart the Squid service and the http proxy should now be working. If your environment is under another proxy server, we will have to configure the Squid server to direct the traffic to the parent proxy server or else the client will still not be able to access the internet. To do so, open up /etc/squid/squid.conf with a text editor. Next, we’ll need to browse to “TAG: cache_peer” and add the following line below the section. This connects to proxy server proxy.tp.edu.sg:80/. We’ll also need to add the following line under the “TAG:never_direct:” section. This will configure all the traffic from the acl localnet to be redirected to the parent proxy server. If we’re configuring this behind a router, we have to set the router to only allow the parent proxy server by applying the appropriate acl rules.